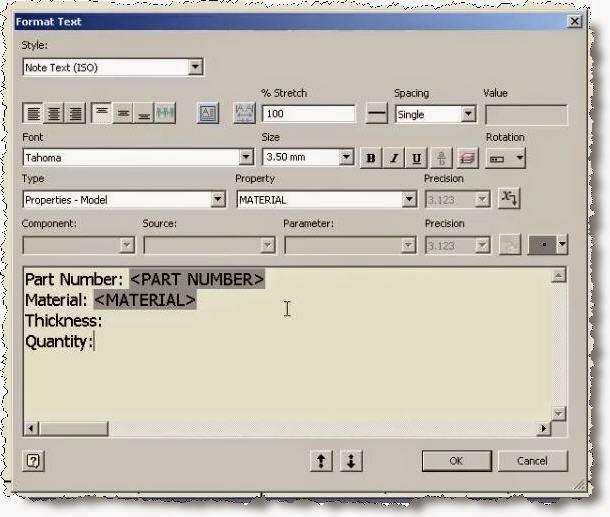 Today I'll show you my way of showing part info on dxf exported drawings. 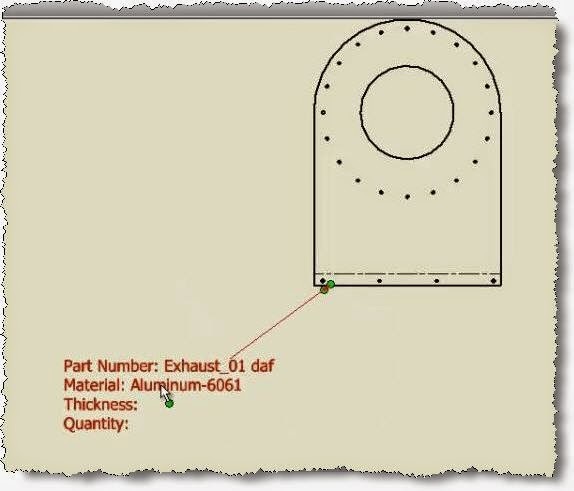 Every once in a while we do dxf profiles of flat pattern sheet metal parts and we need to add more info to each export. We don't always have time to do a drawing for each part but we add views of flat pattern parts on the main assembly layout (or in separate sheets) so we need the extra info on the views for the manufacturer. We normally have: Part number, Material, Quantity, and Thickness as a note linked to each flat pattern view. 1. 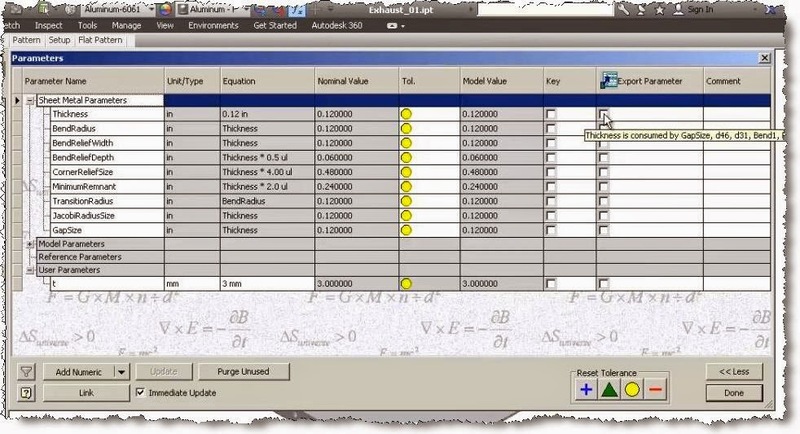 First you need to expose the Thickness parameter of the model so go in functions (part environment) and mark "Export" box on Thickness. I would suggest you do this on the sheet metal template and maybe part template as well (in case you use the convert to sheet metal option). This will add the thickness in custom iproperties of the part. 2. 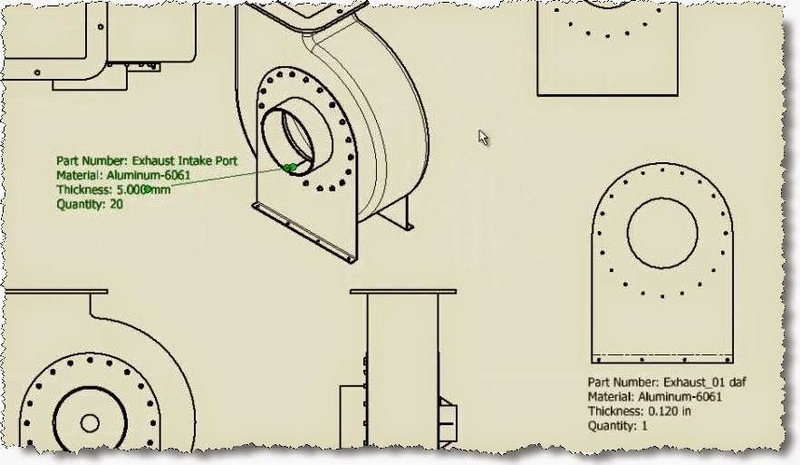 Create a drawing and add a view of a sheet metal part. 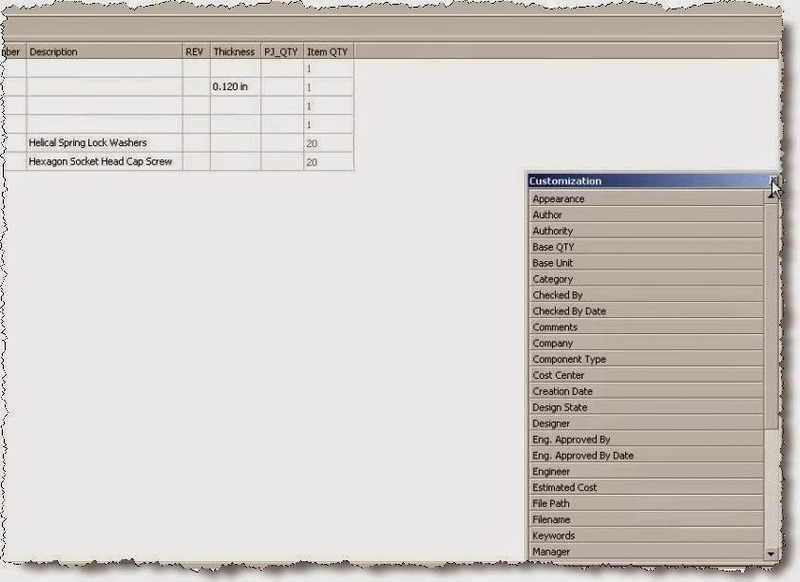 Part Number: <PART NUMBER> link this to the model properties. 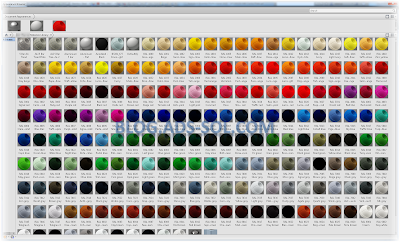 Material: <MATERIAL> link this to the model properties. Finish the symbol creation for now. 4. (b) In the BOM of the assembly. Open the BOM inside the main assembly (main project assembly) and go to parts only (you might need to enable it first). Click on add custom iproperties, type Thickness and type PJ_QTY (or whatever your want to call the part quantity). Add "Item Quantity" and have it next to PJ_QTY. 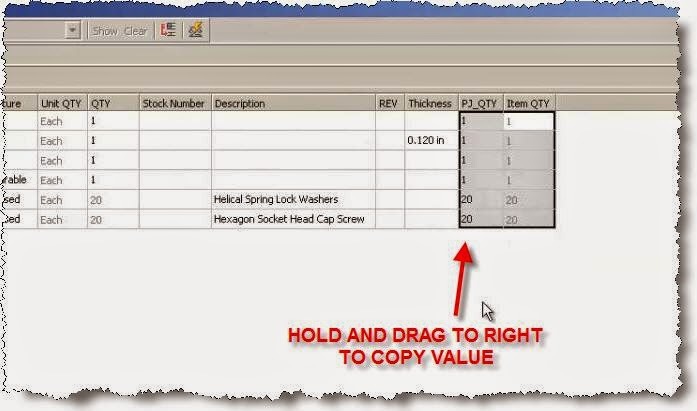 Select the values on the Item Quantity and drag the lower corner of the last cell towards the PJ_QTY row just like in Excel. 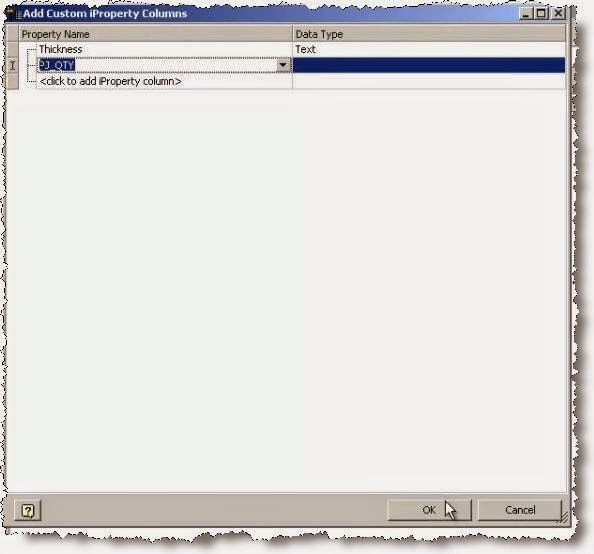 The PJ_QTY part properties gets created on all parts with the value from Item Quantity on it. 5. 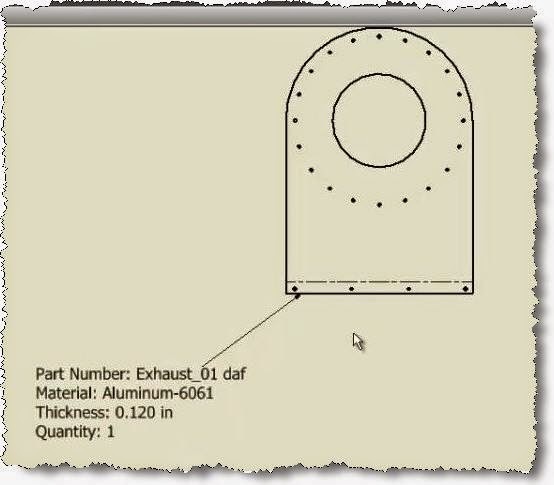 Go back to the drawing and place your symbol on an edge of your sheet metal part just like you would do with a balloon. Quantity: <PJ_QTY> link this to the custom properties of the model. 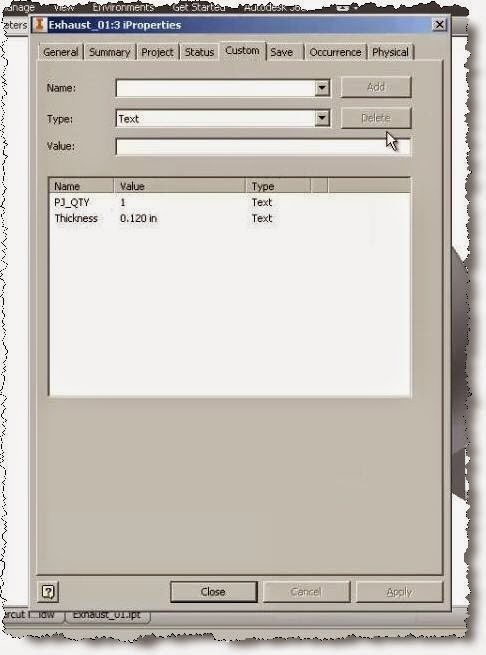 Thickness: <THICKNESS> link it to the custom properties of the model as well. 7. Finish the symbol editing. Now you can copy/insert it on any view, on any drawing before dxf export. I would suggest that you copy it to the drawing template ready to drop in when needed. If you want to add Thickness to standard.ipt template you would be better to open it, convert it to sheet metal and back to normal. The parameters are part of it now and you can mark export on Thickness. In AIP 2015 that I am using now it exports fine but if the dxf export shows up <PART NUMBER> instead of the actual value you need to tweak your export options to convert Drawing Symbols to Blocks. 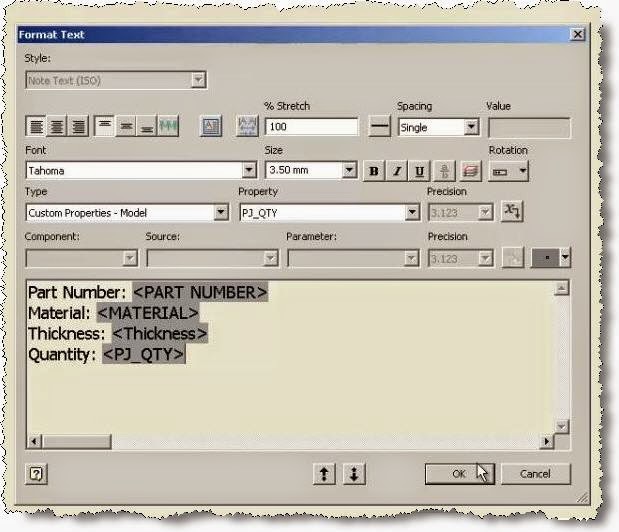 In the Save As dialog click Options, then click Next in the DXF Export Options and in the Export Destination window click on Mapping Options. In the General tab click Convert Drawing Symbols to Blocks. You can save the configuration for later reuse if you want. If you need to explode the block in Autocad head over to Express Tools (this needs to be marked at installation it doesn't' come by default) and then use Explode Attributes rather than using the explode command. In 2015 no matter of the settings in the save as options or the explode method it's working but in older versions I remember needing to take this steps.